For more than a decade, biomedical researchers have been looking for better ways to deliver cancer-killing medication directly to tumors in the body. Tiny capsules, called nanoparticles, are now being used to transport chemotherapy medicine through the bloodstream, to the doorstep of cancerous tumors. But figuring out the best way for the particles to get past the tumor's "velvet rope" and enter the tumor is a challenge scientists are still working out. Drexel University researchers believe that the trick to gaining access to the pernicious cellular masses is to give the nanoparticles a new look—and that dressing to impress will be able to get them past the tumor's biological bouncers. Targeted cancer therapy is most effective when the medication is released as close as possible to the interior of a tumor, to increase its odds of penetrating and killing off cancerous cells. The challenge that has faced cancer researchers for years is making a delivery vehicle that is sturdy enough to safely get the medication through the bloodstream to tumors—which is no smooth ride—but is also lithe enough to squeeze through the tumor's dense extra cellular space—a matrix stuffed with sugars called hyaluronic acid. In research recently published in the journal Nano Letters, lead author Hao Cheng, PhD, an assistant professor with an appointment in Drexel's College of Engineering, and affiliation with School of Biomedical Engineering, Science and Health Systems; reports that the way to get past the tumor's front door has everything to do with how the tiny particle is suited up for the journey. "What we've reported here is a strategy to overcome biological barriers that plague delivery of medication, such as nonvehicle clearance in the bloodstream by the host immune system, and ineffective diffusion in the extracellular matrix of tumor cells," Cheng said. "It's a unique strategy that involves the decoration of nanovehicles with enzymes known to break down hyaluronic acid, which is a main barrier in the extracellular space, and the addition of an extra layer of polyethylene glycol to partially cover the enzymes." 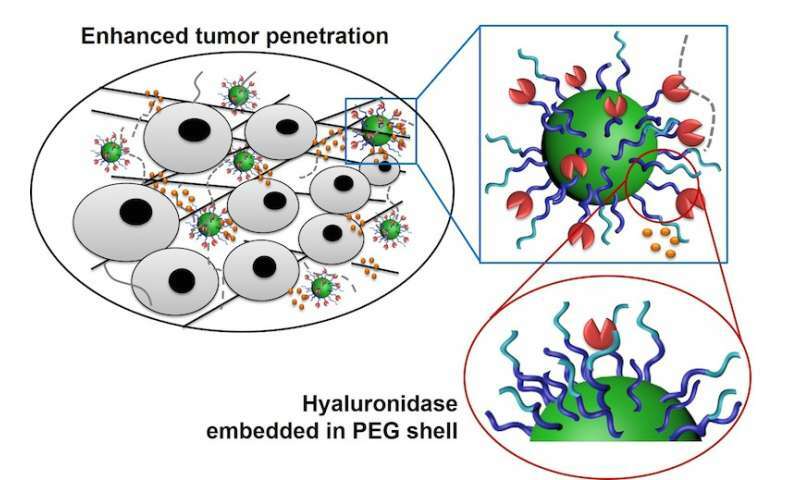 In the paper entitled "Hyaluronidase Embedded in Nanocarrier PEG Shell for Enhanced Tumor Penetration and Highly Efficient Antitumor Efficacy," the group reports that their method is four times more effective at sending nanoparticles into a solid tumor than one of the best strategies currently in use. When cancer medication is loaded in the tiny particle, it has been shown to inhibit the growth of a type of aggressive breast cancer. The team, which also included researchers Wilbur Bowne, MD, an associate professor in Drexel's College of Medicine; Dimitrios Arhontoulis, an undergraduate in Drexel's School of Biomedical Engineering, Science and Health Systems; lead author Hao Zhou and Zhiyuan Fan, doctoral candidates, Junjie Deng, PhD, postdoctoral researchers, and Pelin Lemons, a graduate student, all in the Materials Science and Engineering Department in the College of Engineering, created its nanoparticle suit by starting with one that is common in this area of cancer research and making some key alterations. "In the general design of nanoparticles, bioactive molecules—not limited to enzymes—were attached on the outermost layer of particles," Cheng said. "These enzymes can degrade the extra cellular matrix and enhance the nanoparticle's ability to penetrate solid tumors." But in the body, this extra cargo can cause problems. One issue is that attaching enzymes to nanoparticles could cause them to come up short of the tumor and be cleared by the bloodstream before delivering the medication. There's also a chance that the trip through the bloodstream could render the enzymes inert. To counter these issues and keep the nanoparticles on course, the team decided to add an extra layer that not only protects the precious payload, but also positions the enzymes for maximum impact. "The novelty of our design is that we partially embedded the hyaluronidase enzymes in a second polyethylene glycol layer to form the outer shell of the nanoparticle," Cheng said. "This design dramatically reduces the enzymes' effect on slowing the particle's circulation and allows enzymes to maintain their function after the particle diffuses into the tumor." Embedding the enzymes in the layers of polyethylene glycol (PEG) ensures that the nanoparticle's appearance tricks the immune system into leaving it alone during its trip to the tumor, yet and still allows the particle to deal with any hyaluronic acid it encounters on its penetration of the tumor. Other researchers have tested a theory that exposes tumors to the enzymes first, and then to nanoparticles, but this is not nearly as effective as Cheng's method, because the nanoparticles developed at Drexel retain the enzymes through the duration of their diffusion into tumors, minimizing unnecessary hyaluronic acid degradation. "The degradation of hyaluronic acid removes the barrier for nanoparticles to diffuse and allows them to access more cancer cells," Cheng said. "The enhanced diffusion also increases the accumulation of nanoparticles in tumors, and the more nanoparticles that get into tumors the more effective they are at reducing its size." As part of the research, the team tested their nanoparticle against competitors that did not have a second layer of polyethylene glycol and ones that did not have the ECM-degrading enzymes. It was no surprise that their nanoparticle performed better in both penetrating tumors and accumulating in the cancerous cells. "This exciting, novel nanoparticle drug delivery system will improve delivery of anti-cancer agents, enhancing anti-cancer activity to improve patient outcomes," said Bowne. He foresees enormous potential for this strategy in the neoadjuvant and adjuvant setting for a number difficult to treat cancers such as locally advanced breast, pancreatic and mucin-producing gastrointestinal cancers.